After making 2 large furniture purchases in the new home (photos & posts to come), I decided that in order to avoid the "buying straight from the catalog" syndrome for the rest of the big pieces - I will take my time finding them, wherever they may be. In discussing this approach with my long time, thick-as-thief's friend and style adviser Jeremiah - he suggested I take a look at Krrb.com. Created by AREA 17, a NYC/Paris interactive agency; Krrb was inspired by their love of garage sales, thrift shops, flea markets and street fairs. It is a site for local and in-person commerce, bringing neighbors together and strengthening local economies. There is always something endearing about obtaining vintage, secondhand or uniquely crafted item with a personal story. Most online shops and classifieds feel anonymous, and let’s face it, they are. Unlike its comparisons, like craigslist, Krrb's approach is about what's next door, not a million anonymous results. You’re not flooded with tons of results coming from who knows where either. When listings are fewer and more specific, it creates a cozy environment that helps neighbors get to know neighbors with similar tastes, and gives them first dibs on local treasures. This saves time, money and the hassle of packing, shipping and returns. Local commerce also means less static and fewer scams! All good things! Actually seeing the item you're buying and hearing first hand the back story, adds a layer of richness to the transaction that is difficult to replicate online. Being a scavenger myself, I prefer to touch the objects I buy, and I always enjoy meeting the owner, or sales associate and hearing their stories. But, at the same time I also understand the value of the Internet. As I plan to continue browsing stores and sales all over New York City and on travels, I thought I would try this whole krrb idea out with something small and cheap to test the waters. So much better than the craigslist "furniture to sell/buy" section; I can enter my own address, or I have the option to create other customized lists. This made me think that before a trip, I could check out the local sales - NYC can't have it all! I went ahead and created an account, and started searching. I added a few items to a "My Picks" list, noticed that some were actual stores in my vicinity, and some were just people selling items slightly or barely used. Then I stumbled upon Nancy's corner. Nancy K. had a few home items for sale, and amongst them I saw the photos below, and knew I found my treasure! 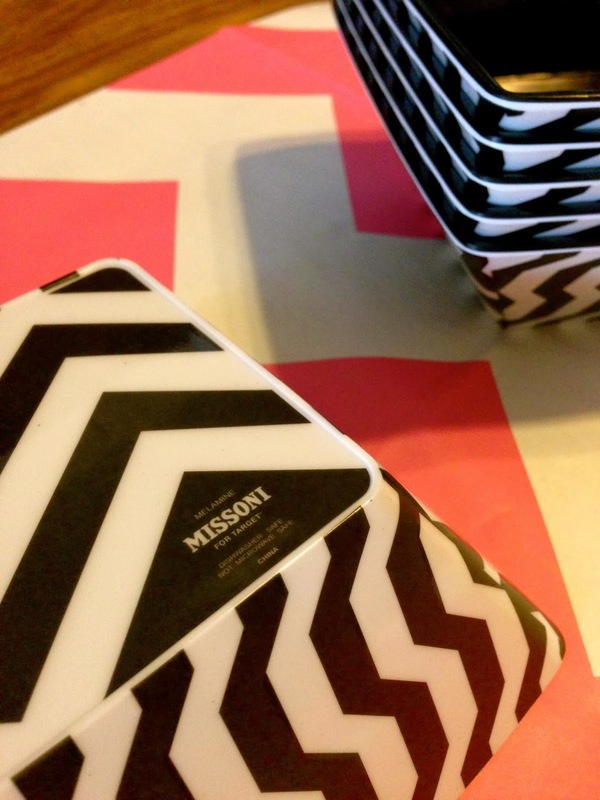 Nancy was selling 6 of the set of 8 Missoni for Target melamine square salad bowls. Ronnie and I met her outside of her quaint Bed-Stuy building, and on her stoop she explained that she only wanted 2 of the bowls when she frantically ordered them on that fateful Target morning back in Fall '11. I missed out on this day, so I was very happy to see someone letting go of these Hi-Low Collabo relics for only $25! I was very happy to add them to the table ware I have so far - somehow I have a small collection of square bowls, and plates! Thanks again Nancy! I staged a little photo shoot last Saturday morning, and as you can see they look great with our plates, Jonathan Adler tea towels, and especially the graphic table runner and place mat set! Do you double-up using your tea towels as trivets like me? 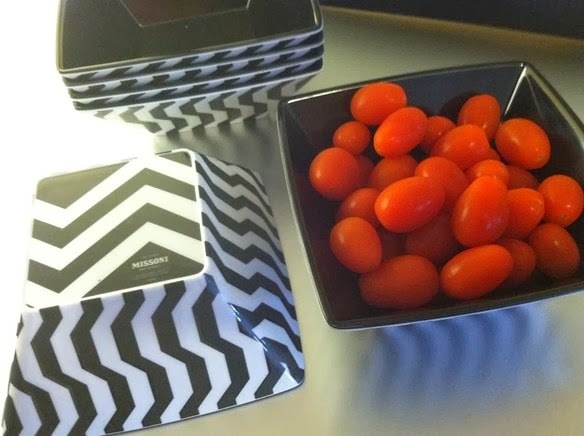 I have so many bright prints, I'm enjoying using them with the table setting too! Another question: Have you heard about MYdrap cotton napkins and placemats? Available in 5 sizes and 27 vibrant colors - these disposable rolls are the perfect thing for this season of BBQ's coming up! We plan on having alot of guests, but I don't want to hand out paper towels. These tear-off rolls have a white outline "stitch" which gives them the cute effect of looking as if they are real sewn fabric napkins. Everyday Fabulous! If you are planning an outdoor party with a color theme - MYdrap has you covered. The word is that they can be washed and re-used, although I haven't tried yet. Of course, I started with basic black, but they have been a hit with our guests so far - I plan on picking up a few more rolls! Am I a little late with the chevron? Oh well - these are all disposable too! I am so excited to have a dining room table, but I am going to keep a healthy stock of decorative placemats, table runners, and napkins that make a statement, but I won't be upset if they get soiled! I have a feeling Big Ronnie is going to be keeping that grill hot as long as the weather is beautiful!